Louella Dondanville , the fifth of six children and only daughter of Louis Dondanville and Janette May Beardsley, was born in Sheridan, Illinois on April 6, 1883. She completed school and helped her mother run a hotel and boarding house in Sheridan. Louella met her future husband, Arthur Angus Mutchmor, at a dance in Sheridan, Illinois shortly after his graduation in 1900 from Northwestern University, School of Dentistry. Arthur had come Sheridan to attend the dance with a friend and declared even before being introduced to Louella that she was the young lady that he would one day marry. Arthur was born in Ottawa, Ontario, Canada on May 1, 1876. He was educated in Ottawa schools and graduated from high school at the age of 14. Louella and Arthur were married in Sheridan on June 1, 1904. They lived in Evanston where Arthur had established his practice. Their first child, Janette Angus , was born in Sheridan on November 26 1905. Shortly after Janette's birth Louella became ill and was advised to move to another climate. Arthur's parents were living in Berkeley, California at the time so he moved his family to California. Arthur established a thriving dentistry practice in Oakland, California. Louella enjoyed her flower garden and was an accomplished artist. Their second daughter Louella Fayette was born in Oakland on August 7, 1915. Louella had full time help raising her daughters including a nurse maid and a cook. The nurse maid called baby Louella a " cute little Toddy " and she was thereafter known to her family as Todd. In the mid 1930s Arthur retired from active practice of dentistry. He and Louella eventually moved to Cloverdale, California to be close to their younger daughter "Todd" and her family who were living in Hopland, California. Both were active in the community. Arthur dabbled in real estate and Louella managed an apartment building. 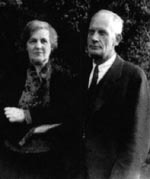 Todd and her husband Jens Stangland eventually purchased a 1000 acre ranch in Hopland and Arthur and Louella moved to the ranch to be close to their family. Arthur died in Hopland, California on April 4, 1954. Louella died in Hopland on September 6, 1981 at age 98. Both were cremated. 155.1	Janette Angus, 1905 -1999 : married, California, late 1920s to Capell, one child, Carmina, '30, divorced, early 1930s, married Pleasanton, California , April 4, 1934 , to David Meyer Ilch ; one child , Paula Lynn , '38. 155.2	Louella Fayette , August 7, 1915 ; married Cloverdale, California, October 14, 1939 , to Jens Melvin Stangland ; one child , Bruce Jens , '42.